The latest update of Papyrus AFP Viewer Freeware, 7.3 (build number 7.30.0.18491) has been released and is now available for download from the ISIS Papyrus website. With the new AFP Viewer parameter ShowPage you can specify the page number on which the AFP Viewer should open the document. This is especially useful for the plugin, if the parent application wants to display a specific page and applies also when calling the AFP Viewer as standalone application. Posted in Uncategorized on January 3, 2019 by claudiasedlak. The latest update of Papyrus AFP Viewer Freeware, 7.2 (build number 7.20.0.18182) has been released and is now available for download from the ISIS Papyrus website. The new Antialiasing button in the View toolbar helps to correct display inaccuracies that may occur either with neighboring areas with shaded or colored background or with lines of minor thickness. These display inaccuracies depend on the used zoom factor. By default, antialiasing is activated.By activating or deactivating the Antialiasing button you can avoid these effects. Depending on the use case, decide for each document separately, if antialiasing should be activated or not. In case neighboring areas with shaded or colored background are combined together to form a compound area, lines in a lighter color may appear between these assembled areas. Posted in Uncategorized and tagged AFP Viewer, isis papyrus on June 18, 2018 by claudiasedlak. The latest update of Papyrus AFP Viewer Freeware, 7.1 SP9 (build number 7.19.0.17130) has been released and is now available for download from the ISIS Papyrus website. Support for plugins is changing for some modern web browsers because of security, performance and stability issues. As a result, the complete web ecosystem is approaching a point where most recent browser versions will not be available to run plugin content. Companies may stay with a browser vendor version that supports plugins. ISIS Papyrus is committed to continue support for IE and Firefox that support NPAPI. As alternative we offer since Papyrus V7.1 SP9 the installation of Papyrus AFP Viewer Freeware as Windows application. The style of the whole user interface was completely reworked including all icons following the ISIS Papyrus user interface design concept. The previously used Properties toolbar was replaced by the Papyrus Software AFP Viewer logo which provides version information and allows you to search for updates or contact ISIS Papyrus. Other items were moved to the Options toolbar. Enjoy the flat design and accessibility optimized style! Together with the new Windows application also a default structure for external resources is provided. You can use this structure to manage you external resources in the file system, which helps to reduce the AFP size considerably. Consult the Papyrus AFP Viewer Installation and Reference Guide for further details. The full documentation for Papyrus AFP Viewer Freeware is now available as 300 dpi AFP document. It also serves as example of how to install and configure Papyrus AFP Viewer Freeware for viewing AFP documents with external resources. Users now can do settings and start the print in one place without having to open an additional dialog. Consult the Papyrus AFP Viewer Installation and Reference Guide for further details. Posted in Uncategorized on April 7, 2017 by claudiasedlak. The latest update of the free Papyrus AFP Viewer has been released and is now available for download from the ISIS Papyrus website. This version enables viewing AFPDS with included PDF files. Posted in New Release and tagged 7.18.0.16112 on June 1, 2016 by Silvia Rosant. Several items of the graphical user interface (button names, tool tips, toolbar names, windows) were adapted to support you with a more intuitive interface. The Print toolbar contains the new Print with copy control button, which enables you to perform advanced settings as paper tray selection and copy control for different Copygroups when printing AFP documents. Together with the download link for the product you also receive a download link for the „Papyrus AFP Viewer Freeware Installation and Reference Guide“. 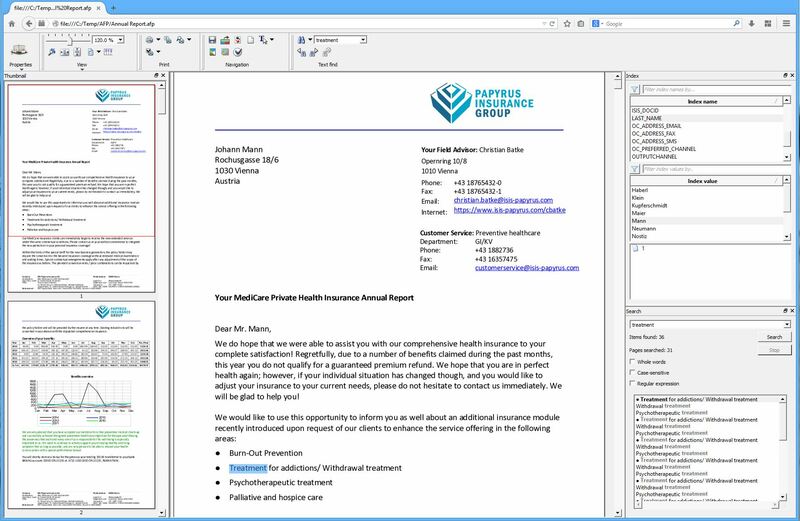 This document describes the functionality of the Papyrus AFP Viewer and explains how to view, save, and print AFP documents. The document addresses administrators and application developers, who install the program and perform settings and configurations to adapt the interface to the user’s needs. Readers interested in the functionality find information about all elements of the graphical user interface. Posted in New Release and tagged Build 7.17.0.15170 on May 7, 2015 by Silvia Rosant. To get the newest version of the Papyrus AFPViewer visit the download area of ISIS Papyrus website and request your personal copy. This page holds additional information on prerequisites and features of the AFP Viewer. If you have any questions, comments or feedback about the Papyrus AFP Viewer please do not hesitate to contact afpviewer [at] isis-papyrus.com. Posted in New Release and tagged Build 7.16.0.13360 on February 19, 2014 by Christoph Ruhsam. TTF support: Papyrus AFP Viewer supports AFP using TTF fonts. Note: all previous installations have to be uninstalled completely before installing this version. All subsequent updates will be possible without the uninstall procedure. Posted in New Release and tagged Build 7.12.0.12181 on May 4, 2012 by Christoph Ruhsam.